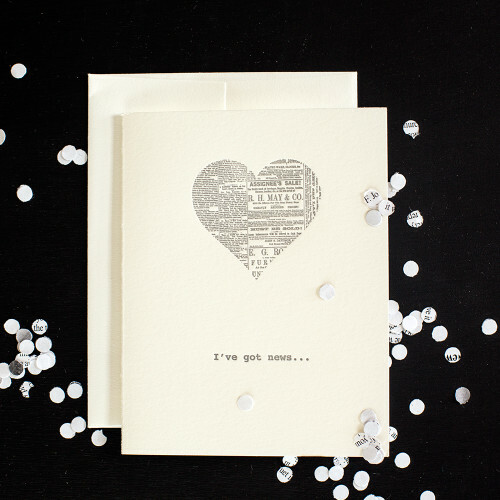 “Start spreading the news……” How clever is this set of 6 note cards, each letterpress printed with vintage type spelling “the news?” Smooth, white, folded notes come with matching white envelopes that have been lined by hand with repurposed newspaper galley proofs. Each envelope holds a different set of news! Have fun with these notes as a gift for that student, friend or family member that lives far away or for yourself to keep them up to date. Size: 5″x7″ The set arrives neatly packaged in a smart, clear box displaying “the news” and an envelope full of the real news. A part of The Edgefield Collection: featuring original letterpress engravings, type and plates once used in our family newspaper during the late 1800’s- early 1900’s.